Moral behavior, preceded by moral thinking, happens to be Creativity and Innovation's neglected sibling. A sibling whose persistent neglect is prophesying a dire future. 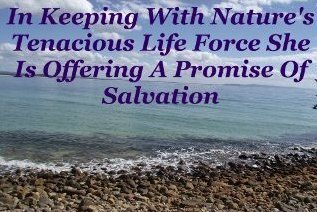 But, in keeping with Mother Nature's tenacious life force, She is offering Her wayward children, that means you and me, a promise of salvation. In the form of a subscription to a policy of weighing up the consequences of our actions before we embark on them. Disregarding or refusing to go the extra mile, by neglecting to clearly think things through to a readily acceptable conclusion whereby we fulfill our moral obligations to each other and our Planet, sets in motion a train of Natural Law that can exact a toll we have no means of meeting. This point needs no laboring - The accumulative evidence is staggering. From permanently polluting our Natural resources to the current world wide financial crisis. And beyond to our battered and tattered personal and international relationships. An example of inadequate moral thinking is in order. In the past, as we built nuclear reactors, using the fission process to produce heat, which in turn is used to create steam to spin turbines that drive electricity generators, and commissioned them to the benefit of Humanity, hardly a thought was given to the life threatening problem of radioactive waste, a known by-product of nuclear fission. The horrifically adverse consequences to both the environment and we Humans, of this well-intentioned but seriously flawed move to provide abundant energy to the masses, are thoroughly documented. While decisions that manifest such consequences are made towards the upper levels of a Nation's Hierarchy, this extreme, but all too common example serves to draw much needed attention to the pivotal nature of anticipating the effects and outcome of any course of action. And the role moral thinking plays in decision making. Minor or major. Criminal behavior, although related consequence wise, is a separate issue, and can be addressed with the same approach to this philosophy, but is not the focus of this website. Here we are discussing decent, honest, Good Human Beings who have an overriding desire to achieve equitable outcomes by doing the Right Thing. No inference to willful wrongdoing is intended in the above example. It is used to highlight the detrimental effects and downside of inadequate (moral) thinking, and hence, inadequate consequences. Consistent with general or “normal” Human behavior, so common is it to all Humanity, this lack of anticipation is directly related to a decision maker's level of awareness and understanding of end results. In other words his or her ability to think, in terms of solving problems. Rank is irrelevant to one's thinking ability. Undeveloped vision is the missing link. This holds true in all Human activities and all walks of life. Appropriate ability to foresee the consequences of one's decisions should be a prime prerequisite of any office or position of authority and responsibility. There is no denying this seemingly absurd habit of not anticipating consequences of our actions is common. And permeates all levels of all societies. Everywhere on the planet. Creating unnecessary, avoidable destructive confusion and waste, impeding civilization. Inherent in incongruous attitudes, culminating in asinine behavior simply not befitting Homo Sapiens, it would appear to the possessors of such attitudes, when things go awry, which happens regularly, that they are afflicted by "bad luck". Not comprehending the fact that they are the brokers of their own, and frequently many others, fortune. In other words, the future. Or an equitable conclusion in the case of relationships, is a potent demonstration of savvy applied intelligence. One is in partnership with Nature. The rewards derived from this manner of thinking are obvious to all. They are well earned and well deserved. And require no justification. This is the manner of thinking espoused by this philosophy of Natural Law. 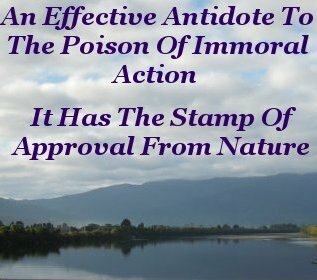 Personal Development offers a genuinely effective antidote to the poison of immoral action. 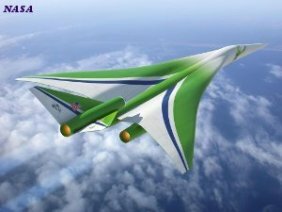 It has the joyous stamp of approval from Nature and presents the safe opportunity of building a sustainable high tech world, prosperous lifestyle, and peaceful future. With abundant profits for all contributors of effort. The often avid short-cuts to profits, exacerbated by inadequate moral thinking, since we settled into communities, has taken a heavy toll in Human suffering and environmental degradation. 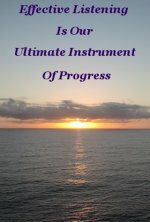 The aftermath we are living in today awakens us to a clear choice that we can purposely and consciously make. 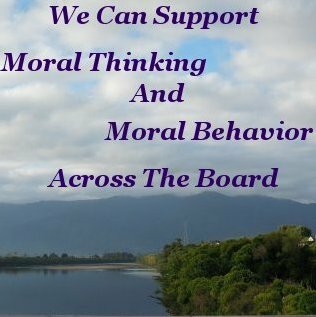 We can support moral thinking and moral behavior across the board, by continuing to make it the basis of our own activities. And by purposely encouraging and supporting our fellows who too are actively doing likewise. In particular our fellows who have chosen to shoulder a leadership role and are involved in the momentous moral decisions made on our collective behalf. To secure our collective future. When we recognize, and then wholeheartedly support these Leaders, the battle for equality will be all but won.